Be careful on the estuary beaches. 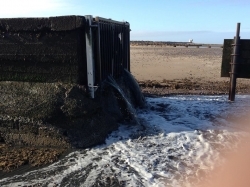 Fleetwood Coastguard have reported that they have seen an increase in sticky mud around outfall pipes possibly owing to increase discharges following the recent heavy rain, coupled with coastal changes after the exceptionally high tides. Although they are referring to Cleveleys / Fleetwood Beach and the Wyre Estuary, there could be similar problems around Lytham and the Ribble Estuary too. This mud sticks !!!! and if you walk into the mud it's difficult to get out. HM Coastguard are trained in mud extraction, and can allocate the appropriate resources (including RNLI lifeboats and SAR helicopters). If you see anyone in trouble at sea or along the coast, ring 999 and ask for the COASTGUARD..... and PLEASE stay away from the muddy areas.